Why Should You Get A Rice Cooker? Have you ever tried cooking rices before? If you have, then I’m sure you have experienced first hand how much of a difficult ingredient it is. You see, rice is an ingredient that requires boiling and steaming. For rice to become completely fluffy and fully cooked, it has to be boiled with just the right amount of water and it needs to get steamed for a couple of minutes. What’s difficult about cooking rice is that the heat temperatures have to be precise for you to avoid burning the rice. Set the heat a little higher than the required temperature and you’ll end up with burnt rice sticking to your cooker. Set the heat a little lower than the required temperature and you’ll end up with hard or uncooked rice. These are the kinds of hassles that you may have experienced or will experience if you try to cook rice in a normal pot and stove. But if you were to use a ﻿﻿rice cooke﻿﻿﻿r, all you will really need to do is place the rice in, add some water, and let the rice cooker do all the work. I am not kidding when I said you will let the rice cooker do all the work, because it really will. Rice cookers can adjust the cooking temperature to the right settings in order to produce thoroughly cooked rice. You won’t even have to worry about keeping your rice warm since most rice cookers can do that for you as well. What’s more is that you can also use rice cookers to cook other kinds of meals including steamed vegetables and fish. You can even use them to make pasta or noodles. ​In order to get the best rice cooker for your home, I would like to encourage you to keep these following f﻿﻿eatures in mind as you look for a rice cooker. Whenever I look for electric appliances, I always check if they come with programmable functions. Such functions can be very handy, especially when you prefer to have a machine that can operate with just a single touch of a button. The keep warm feature is one of the most useful features that can ever come with a rice cooker. It will allow you to serve completely warm rice every single time even hours after cooking. What’s great about a keep warm function is that it will allow you to be more efficient in the kitchen. Covers may seem like a small deal when it comes to rice cookers, but they are actually an essential part. When buying a rice cooker, you must make sure that it comes with a tight-fitting lid that will keep the warmth and steam in as your rice gets cooked. Since rice cookers can be used for steaming as well, you may want to check if the rice cooker you are looking at comes with steamer trays or other useful accessories that can be used for cooking. Accessories that usually come with rice cookers are measuring cups and serving spoons. 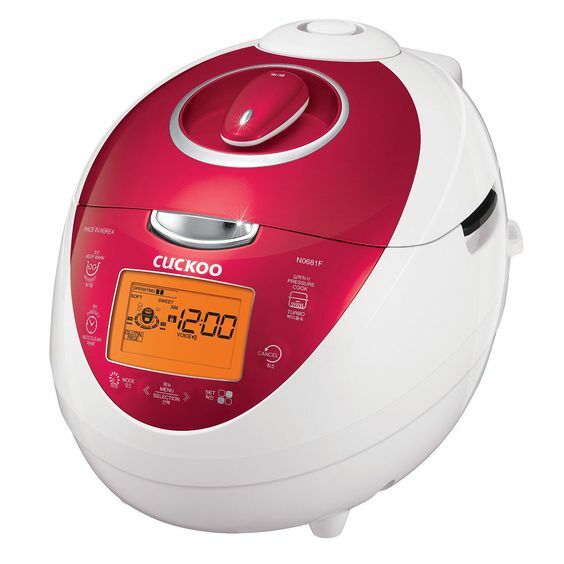 If you love eating soft, fluffy, and warm rice and don’t have time to cook rice using a normal pot, then this electric heating rice cooker from Cuckoo may be a great choice for you. This rice cooker comes with a cute looking design that makes it ideal for fun looking homes, apartments, or kitchens. It has a bright color to it that will make it pop out of your counter. Another great thing about this rice cooker is that it comes with a non-stick coating. It’s coating makes it very easy to clean even when the rice has dried out. This rice cooker is also fairly advanced. It comes with a fuzzy logic and intelligent cooking algorithm that will make for perfectly cooked rice every single time with just a press of a button or two. If you’re worried about energy consumption, don’t be. 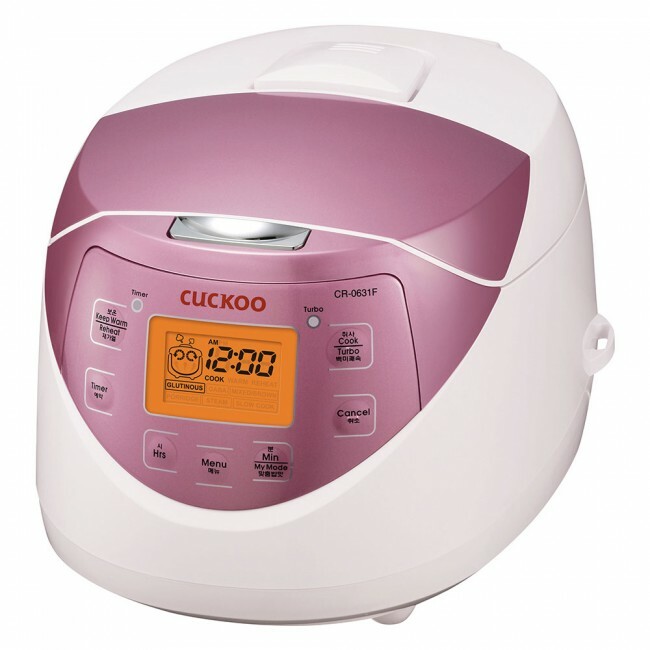 This cuckoo rice cooker is only powered by 120V, a standard in most homes. If you consider yourself as a classy person with classic taste, then I’m sure you will like this electric rice cooker from Cuckoo because it comes with a relatively sleek looking design that makes it look like a high-end kitchen appliance. With a single look, you will be able to feel that this rice cooker packs a lot of interesting functions. It has a modern looking design and a clean interface that will allow you to navigate each and every one of its function with ease. 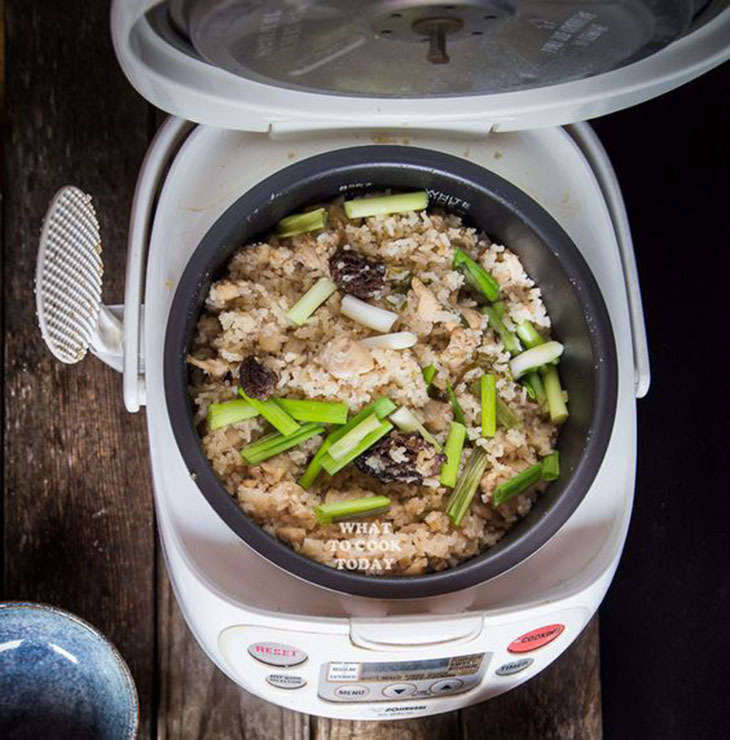 This rice cooker can help you cook up to 10 cups of uncooked rice. That’s almost equivalent to 20 cups of cooked rice! So if you have a large family to feed or if you share your home with other people who eat rice as well, this is a great product that will certainly provide you with ample amounts of cooked rice when needed. What’s great about this rice cooker it that is comes with a x-wall diamond coated inner pot as well as a stainless steel detachable inner lid that is very easy to clean and maintain. 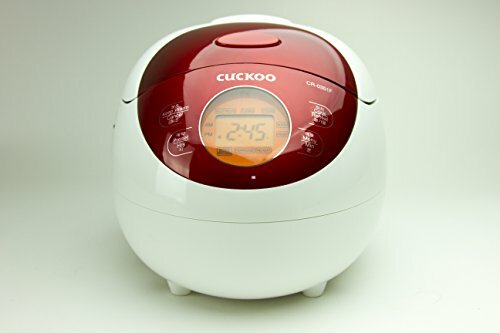 If you live alone or with a partner, or if you’re plainly looking for a compact rice cooker that will allow you to cook just the right amount of rice for a single person or two, then you should check out this compact rice cooker from cuckoo. 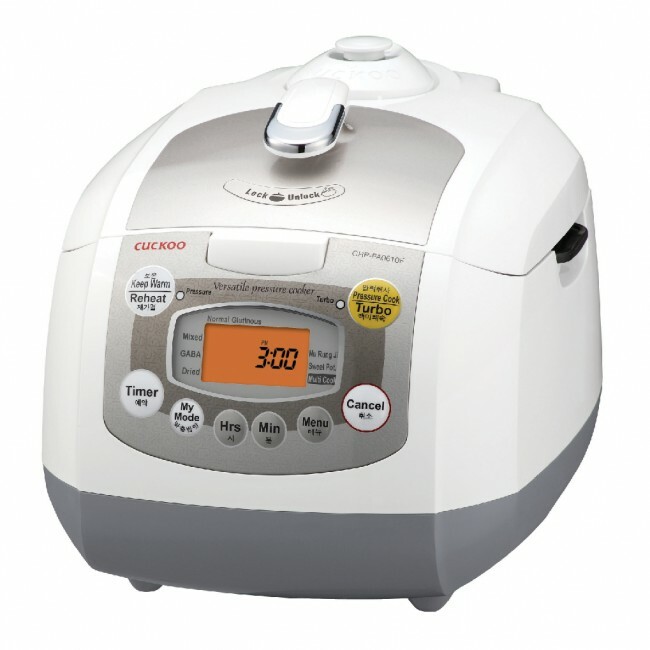 This rice cooker can accommodate up to 3 cups of uncooked rice. It is perfect for people who live alone or for a small group of three. It also has a cute looking design that makes it ideal for fun looking homes, apartments, or kitchens. It has a bright color to it that will make it pop out of your counter. What I like about this rice cooker is that it can easily be cleaned after use even when the rice has dried out because it comes with a non-stick coating. All you really have to do if your rice dries out it soak it in water for a minute or so and wipe the rice away with a dish sponge. 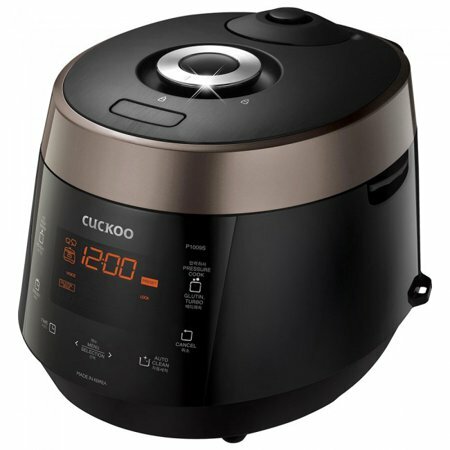 Another high-end rice cooker in this list is the Cuckoo CRP-HZ0683F. This rice cooker will surely make your home look extra classy because it comes with a very attractive and sleek design. This rice cooker can help you cook up to 6 cups of uncooked rice, which makes it an ideal choice for households with many people. What’s more is that this rice cooker is also supported by an intelligent cooking algorithm that will do every bit of the cooking for you. Another great thing about this rice cooker is that it is made with 304 stainless steel, a food grade steel that is very durable as well. It even comes with a detachable inner lid for easier cleaning. Lastly, the best thing about this rice cooker is that it comes with a set of programmable functions that will allow you to perfectly cook rice without having to set your preferred settings all over again. 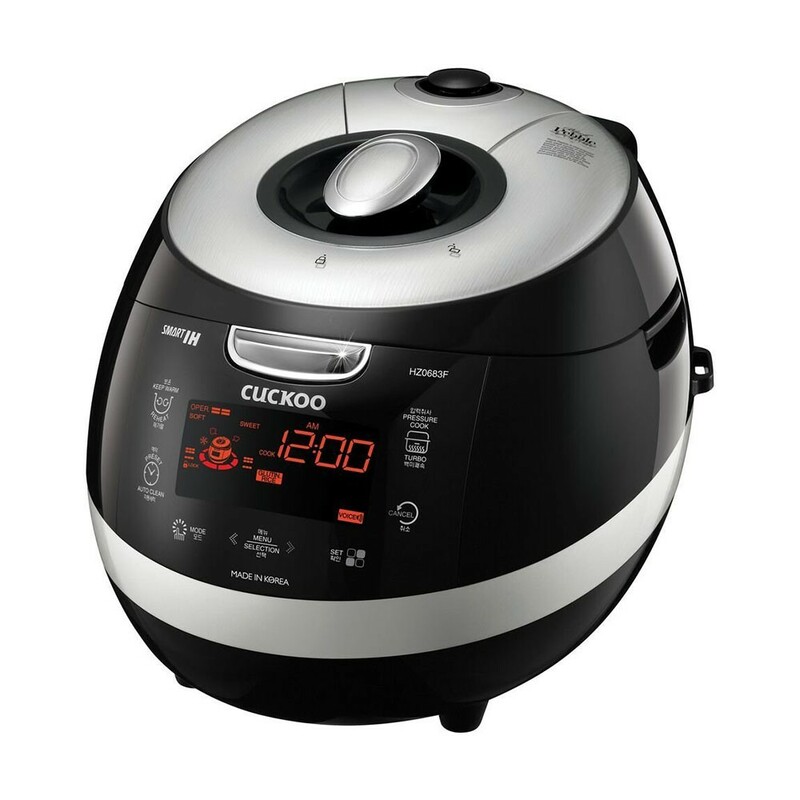 If you are looking for a rice cooker with a set of interesting programmable features, but doesn’t come with a price tag that will break the bank, then you should definitely check out the CRP-FA0610F from Cuckoo. The best thing about this rice cooker is that it comes with a set of programmable functions that will allow you to perfectly cook rice without having to set your preferred settings all over again. What’s more is that this rice cooker is also supported by an intelligent cooking algorithm that will do every bit of the cooking for you. 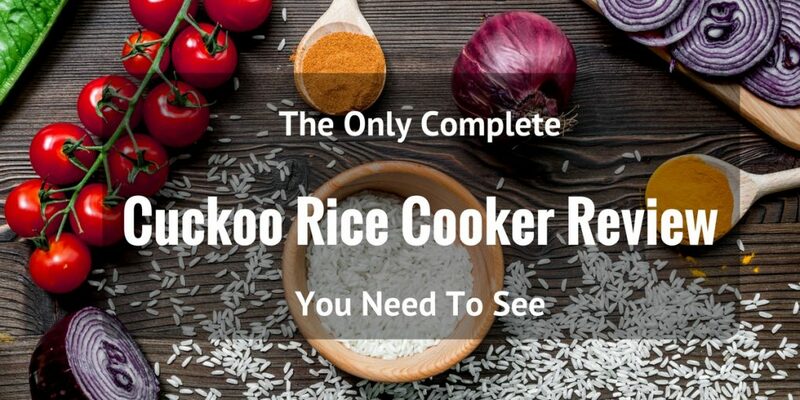 The Cuckoo Electric Heating Pressure Rice Cooker CRP-P1009SB is certainly the best out of all the Cuckoo rice cookers I have mentioned. What makes it so is its interesting set of features including its 10-cup rice capacity, sleek and modern looking design, programmable features, and a detachable lid that makes it ultra easy to clean.